Jake Hildebrand, who boasts a .950 save percentage over his past six outings is second Tulsa goalie to win the weekly award this season. PRINCETON, NJ – Jake Hildebrand of the Tulsa Oilers is the CCM ECHL Goaltender of the Week for Nov. 27-Dec. 3. It is the third time in his career that he has received the weekly honor. Hildebrand went 1-1-1 with a 1.96 goals-against average and a save percentage of .949 in three appearances at Idaho last week. The 24-year-old stopped 40 shots in a 4-3 shootout loss on Wednesday, made 46 saves in a 4-1 win on Friday and turned aside 25 shots in a 2-1 loss on Saturday. A native of Butler, Pa., Hildebrand is 3-6-4 with a 3.02 goals-against average and a save percentage of .914 in 14 appearances with the Oilers this season. He ranks third in the ECHL with 415 saves and is eighth with 776 minutes played. 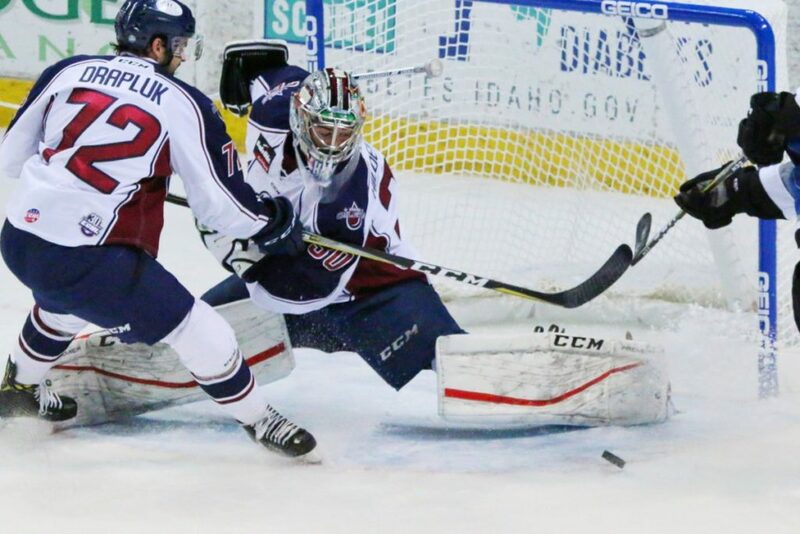 Hildebrand has appeared in 67 career ECHL games with Tulsa, Indy and Allen posting an overall record of 26-28-9 with four shutouts, a 3.46 goals-against average and a save percentage of .904. Prior to turning pro, Hildebrand played four seasons at Michigan State University where he saw action in 133 career games, recording a 2.54 goals-against average to go along with a .921 save percentage. He also played three seasons in the United States Hockey League with Cedar Rapids and Sioux City. Hildebrand joins teammate Devin Williams, who earlier in the season also won CCM ECHL Goaltender of the Week for Oct. 23-Oct. 29. Tulsa heads to Toledo next for a 6:15pm CT tilt against the Walleye Friday night at the Huntington Center to play the first of their final two road games of a 14-game stretch. Catch all the action on the Sports Animal (99.9FM/1550AM) in Tulsa, ECHL.TV, or www.tulsaoilers.com (Listen Live), with coverage starting at 5:55pm CT. The Oilers then head to Cincinnati for a 6:35pm CT game against the Cyclones Saturday at U.S. Bank Arena.